How green is your building? The building's green credentials have been recognised internationally, most notably by the us Green Business Council (usgbc). The Washington-based council awarded it the Leadership in Energy and Environmental Design's (leed) platinum rating in 2003, spurring an architectural trend in the country. "There are around 100 buildings in various stages of completion in India that seek conformity with leed standards," according to gbc's senior counsellor S Srinivas. He claims gbc is a zero discharge building, a fourth of its power demands is met from solar energy, the building consumes 40 per cent less water and uses 50 per cent less electricity than a conventional structure. Spread over 2 ha, gbc has been built using flyash bricks, has rainwater harvesting channels and reed bed-based sewage treatment utility; an electric car charging station, a roof covered with gardens to insulate from heat and 25 kiloWatt (kW) capacity solar panels. But there is a flip side to these achievements. gbc-- with a built up area of 20,000 sq ft--was constructed at a cost of Rs 10 crore in 2003, which Srinivas says is around 18 times the cost of a conventional building of similar dimensions. "We had to import high performance double glazed glass, floor carpets, toilet cleaner (which it still imports) and gadgets like building management system (bms) to meet usgbc's standards for platinum rating," he explains. That is the crux of the problem say Indian architects. "Labelling green buildings is getting a bit too commercialised and everyone seems to be jumping onto the bandwagon. We need to realise that a building is not a piece of equipment to be rated; it is architecture--a living entity forpeople to live and work in. Architecture is the symbiosis of tangible and the intangible. The intangible refuses to be quantified but it is this component that truly makes architecture," says Arvind Krishan, professor at the department of architecture, School of Planning and Architecture, New Delhi. All experts agree that buildings--new and old--are part of the environment problem and solution. 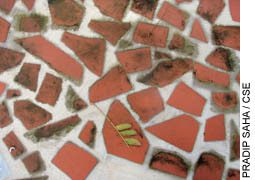 Therefore, what is necessary is to evolve an Indian definition and practice of green architecture. nidhi jamwal and minti jain explore the dimensions of this puzzle. Hyderabad's hitec (Hyderabad Information Technology Engineering Consultancy) city exudes all the glitz of post-liberalised India. Plush office complexes, exuberant it parks, swanky exhibition centres showcase a township riding the crest of the country's 'economic boom'. Amidst this opulence, a structure stands out cii- Sohrabji Godrej Green Business Centre (gbc). Experts today believe that buildings account for a sixth of the world's fresh water withdrawals, a quarter of its wood harvest, and two-fifths of its material and energy flows. The recent Intergovernmental Panel on Climate Change's (ipcc) report, Climate Change 2007 Mitigation of Climate Change, estimates that the growth of direct emissions from buildings was 26 per cent between 1970 and 1990. The report reckons that adoption of energy efficiency measures could lead to a 30 per cent fall in the building sector's green house gas (ghg) emissions by 2003. Buildings thus offer a great chance to reduce--and avoid--climate-forcing emissions. The industrialised world's carbon balance-sheet makes this evident.In the us, buildings account for about 36 per cent of its total energy use, 65 per cent of electricity consumption, 30 per cent of total raw material use, 12 per cent of potable water consumption, 35 per cent of carbon dioxide emissions, and 49 per cent of sulphur dioxide emissions. According to a report of department of communities and local government of the uk government, Building a greener future Towards zero carbon development, "The uk emitted more than 150 million tonnes of carbon dioxide in 2004. Energy use in buildings accounted for nearly half these emissions, and more than a quarter came from the energy [used] to heat, light and run homes." The uk government has now set a target for moving to zero carbon housing in the next 10 years. It has set three steps moving first, in 2010 to a 25 per cent improvement in the energy/carbon performance set in building regulations; then second, in 2013, to a 44 per cent improvement; then, finally, in 2016, to zero carbon. Green architecture then is all about reducing ecological footprints of buildings. It looks at the embodied energy of a building and follows the life cycle assessment approach. Embodied energy is what is consumed by all the processes associated with constructing a building. This includes mining and manufacture of materials, their transport and administrative functions. Until recently, it was thought that the embodied energy content of a building was small compared to energy used in operating the building over its life. So, most efforts went into reducing operating energy by improving the energy efficiency of the building envelope. But recent research shows that embodied energy is equivalent to many years of operational energy. Australia's Commonwealth Scientific and Industrial Research Organisation, has found that materials used in constructing an average house embody about 1,000 gigaJoule--equivalent to about 15 years of operational energy use. For a house that lasts 100 years this is over 10 per cent of the energy used in its life. What then is the situation in India? The construction industry is growing at a rate of 9.2 per cent per annum as against the world average of 5.5 per cent per annum. It is one of the largest in terms of economic expenditure, use of raw materials (natural resources) and environmental impacts. But there is little real green thought in the sector. Malls, office multiplexes, housing conglomerates springing across the country, ape the Western look. Think Gurgaon near New Delhi, or Whitefield in Bangalore, or Bandra-Kurla Complex in Mumbai. They conjure up images of centrally air-conditioned glitzy glass buildings.But in Indian context where the chief aim is to keep buildings cool, the conventional glass used in these buildings ends up increasing the indoor temperature, forcing air-conditioners to be set at low temperatures. Then, windows cannot be opened and the advantages of India's seasons cannot be taken to reduce energy use. Because windows need blinds, natural light, our other natural advantage, is wasted. That glass manufacturing is highly energy-intensive process is also forgotten. The green building industry believes the answer lies in new expensive glass types, which are better in insulation. That is is why they see green architecture as a huge business opportunity. But will this work in India? Currently, there are no environmental regulations for India's construction industry. Most building codes are voluntary. They focus on reducing operational energy, leaving out other important factors such as water, waste, indoor air pollution, raw materials, renewable energy use. But the good news is that Indian architects are following local climate and local ecology to find new and diverse answers. The construction material in buildings have evolved from mud to sun-dried bricks to burnt bricks, then to lime, glass, iron products, lime-pozzolana cement, aluminium, portland cement and plastics. 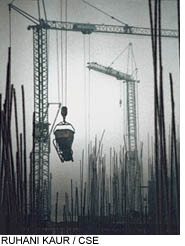 Production of building materials has moved from highly decentralised and labour-intensive processes to centralised, machine-dependent industry mode. This needs hauling of raw materials and transportation of finished products over a large distance, resulting in fossil fuel consumption and carbon emissions. The choices of materials and construction methods can significantly change the amount of energy embodied in the structure of a building. The answers are not blowing in the wind. Each choice of building material has its trade-off. For instance, all products like mud, stone, cement, steel, etc have an embodied energy, which varies according to local conditions.The point then is whose embodied energy is smaller and whose footprint is sustainable in a given geographical area. Canadian Architect, a monthly architecture magazine, has calculated embodied energy of about 30 construction materials and found synthetic carpets and aluminium to have the highest embodied energy of 148 megajoules (MJ) per kg and 227 MJ per kg respectively. 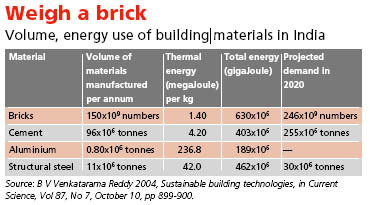 As against this the embodied energy of stone (local) as 0.79 MJ per kg; brick as 2.5 MJ per kg; plywood 10.4 MJ per kg; glass 15.9 MJ per kg; steel 32 MJ per kg; zinc 51 MJ per kg; pvc 70 MJ per kg; and paint as 93.3 MJ per kg. It would be interesting to estimate the ecological footprint of buildings to see if architects actually use more or less than one square metre of available ecological carrying capacity to deliver one square metre of building area. 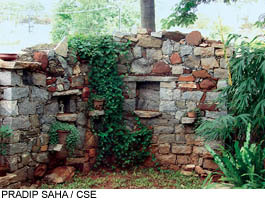 iisc has done some comparative assessment of buildings using different construction material. It found that a reinforced concrete multi-storey building consumes highest amount of energy at 4.21 gj per square m (gj/sq m) of built up area, whereas the energy consumed by the load bearing conventional two-storey brickwork building is 2.92 gj/sq m, which is 30 per cent less than the former. In sharp contrast, a two-storey building using alternative building material like stabilised mud blocks (smb) walls, smb filler slab roofs, is highly energy efficient and consumes only 1.61 gj /sq m of energy. Anil Laul, principal architect of Faridabad-based Anangpur Building Centre (abc) has implemented the principles of utilising local building materials at his centre while constructing it in 1992. abc is constructed on an abandoned quarry at a cost of mere Rs 208 per sq ft [1992 cost, which is now Rs about 500 sq ft] as against the cost of Rs 2,300 for per sq ft for modern green buildings. According to V Suresh, former managing director of hudco, "35 per cent of the cost in constructing a building is labour costs while 65 per cent goes into raw material; and within latter, cement and steel alone account for 30 per cent of the cost. For instance, one tonne of cement costs Rs 5,000 and a tonne of steel costs Rs 35,000; and price of both the raw materials is on a rise, not to forget their environmental costs... On an average, construction cost for a house is about Rs 700-800 per sq ft and should be brought down without providing inferior solutions. Low cost should not mean low quality and poor strength. It should stand for cost-effective technology that is less expensive and also strong, durable, functionally good and beautiful," says Suresh. To get out of the cement-steel frame, many are experimenting with traditional materials such as mud, clay, straw, stone, wood and bamboo. But as yet, these 'local' building materials do not pose a real challenge. For instance, Neelam Manjunath of Manasaram Architects Bangalore along with Bangalore-based Indian Plywood Industries Research and Training Institute (ipirti) has constructed houses using primarily bamboo along with other locally available resources that consumed 7.1 times less energy that a conventional house of similar dimensions (see box Bamboo no more poor man's material). 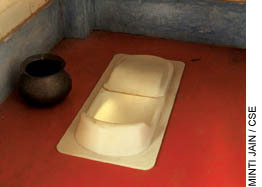 K Jaisim, an architect with Bangalore-based Fountain head uses various materials like stone, bamboo, terracotta, etc and claims that his construction cost (Rs 400-500 per sq ft) is 30 per cent less than the conventional buildings because he does not use plaster, very less lights, makes use of rough finishing, etc. He narrates an interesting incident. "I once visited a desert camp in Muscat. Outside temperature was about 48 or 50 degrees Celsius, where as inside it was freezing cold because of the air conditioners. In a corner, fire was lit in the fireplace with a number of Canadians and Europeans sitting around it. I didn't know whether to be amused by this," says Jaisim. The International Energy Agency has estimated that the global building sector, which consumes roughly half the electricity generated in the world, can be 70 per cent more energy efficient. It estimates that energy spent on lighting, roughly a fifth of the building sector's energy needs, can be easily cut with the introduction of energy saving lights like cfls. In India, there are few estimations of the energy use in buildings but everyone agrees that they should be more energy efficient. The Union ministry of power's research points out that about 20 to 25 per cent of the total electricity utilised in government buildings in India is wasted due to unproductive design, resulting in an annual energy related financial loss of about Rs 1.5 billion. The annual energy consumption per square metre of floor area in Indian commercial buildings is about 200 kWh. This can be brought down to 120-160 kWh by shifting to efficient design alone.With the June 2007 announcement of Energy Conservation Building Code, 2006 (ecbc) by the Bureau of Energy Efficiency (bee), the government aims to save 1.7 billion units in the first year of the code's implementation. Its energy audit of government buildings shows that much can be done to save energy and so save money, even in current constructions. The point is why, if all this is so easy (and makes economic sense) is so little happening. 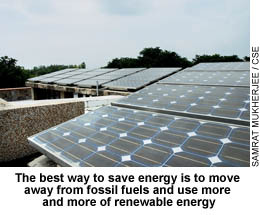 The best way to save energy is to move away from fossil fuels and use renewables. But there are constraints, especially with solar power, which is very expensive and does not make business sense. "We have installed solar panels worth 25 kW capacity at a cost of Rs 65 lakh at gbc, but it is for demonstration. Solar power is not economical. We sell about 100 units per day of green electricity to state grid at a rate of Rs 1.50 per unit. But in turn, we buy power from them at Rs 5.50 per unit. Also, the pay back period for solar power is more than the life of solar panels themselves," says Srinivas. There are various ways of reducing a building's energy consumption. Use of energy efficient materials and technologies, and appropriate design and architectural features are among them. Passive architecture in plain terms is design that does not require mechanical heating or cooling for thermal comfort and artificial lighting for visual comfort. Homes that are passively use natural energy flows such as sun, wind, plantation and existing site conditions to maintain thermal comfort. A 2005 study, Natural cooling of residential buildings in hot-dry climate, by department of architecture and planning, iit Roorke, looked at traditional buildings in Gulbarga, Karnataka and found out why they did not require artificial cooling. "The most prominent characteristic of a traditional building in Gulbarga is a thick external wall with small openings, which reduce transfer of heat. The..building is square or rectangular with a central courtyard. Rooms are arranged around it. All doors open towards the courtyard. Only the main door is placed on the external wall. The roof is made with well-compacted mud and is supported by wooden joists and planks.Stone, mud and wood are used for construction," reads this 2005 study published in Asian Journal of Civil Engineering (Vol 6, No1-2). "The buildings functions according to seasonal changes. In summer, one feels cool during daytime. Courtyard and roof top is used for sleeping as the rooms remain hot at night due to small ventilation. In winters, the heat stored in walls during daytime radiates at nights in the rooms, providing comfort without the use of a mechanical system," the paper notes. The principle of passive energy is increasingly incorporated in modern green buildings. 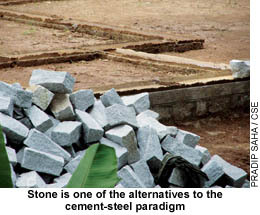 Most are built using flyash-based building materials which when compared to cement are bad conductors of heat. "gbc was constructed using only flyash bricks and flyash-based cement. Also we have avoided use of glass in western and southern direction of the building from where heat penetration is maximum. Various other measures have ensured that gbc consumes only 450-500 units of electricity in a day, which is 40 per cent less than a conventional building. A conventional building of the size of gbc would require at least 120 ton ac to keep it cool, but we are using only 50 ton ac," says Swastik Banerjee, director, gbc. But there is a trade off. Most of these modern green buildings are centrally air-conditioned because they have to maintain indoor air quality and also meet stringent international standards. But ideally a green building show allow its users to open doors and windows and let fresh air circulate. This is exactly why usgbc's leed rating with it's emphasis on air-conditioning is not getting accepted in the Indian context. "It is like promoting use of more energy by using central air-conditioning and then working to reduce it," says Neelam Manjunath managing trustee of Centre for Green Building Materials and Technology, Bangalore. Natural ventilation which flushes heat from a building and provides cooling air movement is a vital strategy for reducing air conditioner use. For example, an indoor air speed of one metre per second can have a cooling effect of 3.8c. The best energy conservation programme is one that ensures heat or cool does not escape the building. The modern way to insulate is to use use high performance glass that reduces heat ingress (it allows only 23 per cent heat transmission in contrast to conventional glass that allows 60 per cent heat transmission) and at the same time allows higher penetration of daylight. It can lead to energy saving of 35-40 per cent as compared to conventional glass, claims Srinivas. 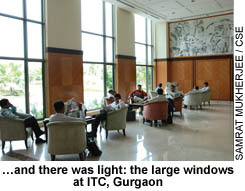 Many buildings in India, such as Chennai-based neg Micon (India) Ptv Ltd, Kolkata-based Technolpolis are using this glass. Though it costs almost 50 per cent more than conventional glass, gbc claims that typical pay back period of high performance glass is about 3-4 years. But there are ecological footprint question marks attached to the use of such glass. High performance glass has an embodied energy content (that of conventional glass is 15.9 MJ/kg, compared to the local stone at 0.79 MJ/kg) and its manufacture is energy intensive. So what should a green building opt for--high performance glass or flyash bricks? There are definitely no clear answers. Water consumption by building industry is not limited to use in toilets and kitchens alone. When a building is getting constructed, it consumes huge amounts of water. There is little data on the water footprint of buildings but available figures paint a grim future. According to usgbc, buildings account for over 12 per cent of potable water consumption in the us and almost 65 per cent of waste output comes from building construction sector. The us Environment Protection Agency (usepa) estimates that nearly 40 per cent of water consumed in a household goes for flushing purposes. Toilets, showers, and faucets combined represent two-thirds of all indoor water use. The average American uses about 34,000 litres of water to flush 870 litres of waste down the toilet per year, estimates usepa.Effective from January 1, 1994, the Energy Policy Act of 1992 (Public Law 102-486) requires that all new toilets produced for home use must operate on 6 litre per flush or less. In Australia, building construction consumes 15 per cent of total water use. In the uk, more than 30 per cent of the total domestic water use goes into flushing toilets. In India, flushes are water-wasteful with each flush, over 10 litres of clean water goes down the drain (Ecologically Mindless, Down To Earth, February 28, 2002). A major aim of green building is to save water and minimise waste/sewage generation. Some buildings go in for water harvesting and water recycling, whereas others adopt technologies that minimise water consumption and wastage. Experts claim that green buildings consume 30-40 per cent less water than conventional buildings. Most green buildings are zero discharge structures not a drop of water or sewage leaves their premises. Rainwater is harvested either to recharge groundwater or collected in a pond and reused for gardening and flushing. Sewage and grey water is collected separately and treated on campus and reused for non-potable purposes. Hence, there is a huge reduction in total water consumption. And there are various ways of reducing water consumption in a building/household (see box Water less). Almost all the industrialised countries have put in place a system of rating buildings, environmentally. While leed is one of the most popular rating systems and has been adopted by over 20 countries, many governments have formulated their own standards according to local conditions. But India has no comprehensive legislation or code for green buildings. After much dithering, the Bureau of Energy Efficiency (bee), set up under the Energy Conservation Act, 2001, released the Energy Conservation Building Code, 2006 (ecbc) in June this year. But it is incomplete, and also not mandatory. The mandate of this code is to "prescribe energy conservation building code for efficient use of energy and its conservation in a building or building complex"; and as per ecbc, building is one which has "a connected load of 500 kW or greater and used for commercial purposes". ecbc is a set of requirements to be met at the time of design and construction so that operational energy requirements of buildings remains low. Its basically looks at the building envelope, ventilating, heating, cooling and lighting systems of buildings. "ecbc covers only new large commercial buildings such as hotels, hospitals. But not residential, agricultural and industrial units. Residential areas do not use large amounts of power," says Ajay Mathur, director general, bee. Environmentalists says ecbc should be made mandatory. Mathur claims it might become so in 3-5 years, but before that a market for green buildings needs to be created in India. But some green building materials are not even recognised legally in India. 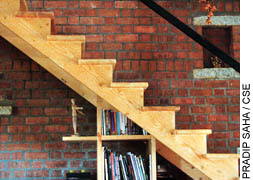 Says Jagadish Vengala of ipirti, "Bamboo can be used in sophisticated house construction. But due to absence of any standard building code for bamboo so far, apart from method of test, it has not been officially recognised as a building material." But efforts are definitely being made in the right direction. For instance, the New Delhi-based Environment Design Solutions is working on a pilot project with the Pune Municipal Corporation in promoting eco-housing. The corporation offers incentives such as reducing the development charges on a green residence for both builders and residents. The New Delhi-based The Energy Resource Institute (teri) claims to have prepared an indigenised green building rating system. Commonly known as griha [Green Rating for Integrated Habitat Assessment], it is applicable to commercial, residential and institutional buildings. But says Suresh, "griha is just another method of rating. These deal with a very small segment of green building issues; they have some strengths but many weaknesses. They do not fully understand issues of the built environment." Arvind Krishan of the School of Planning and Architecture, Delhi believes that "Environmental crises can become an opportunity for creating a new language of architecture.A new era beckons architects." sir, detailed information is given. Thank u very much..I want list of materials used in green building as per the standards of LEED. Could u send the information at the earliest. Thank u for getting a excellent guidance and service.